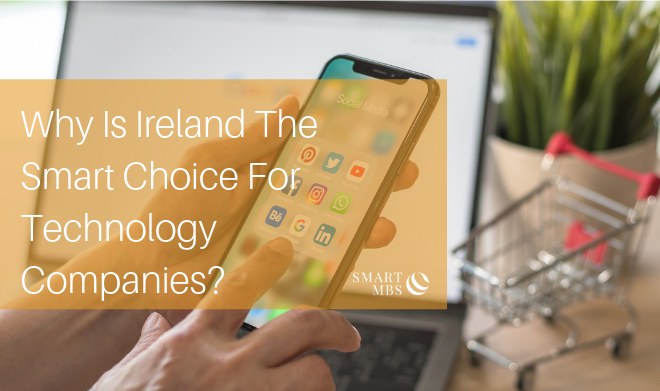 Why Is Ireland The Smart Choice For Technology Companies? As you would have read in our blog recently, there is a lot of good news in the Irish technology sector. During the summer months it was announced the Technological University in Dublin would become a reality after seven years of planning. Once courses begin, it’s expected there will be 30,000 students in attendance making it the largest university in the country. With over 100,000 people in Ireland employed by tech companies it makes sense to equip graduates with the right skills to meet employers’ demand. And it’s not all about locating in the capital either as regional locations are thriving too. Why do tech companies choose Ireland? Here are just some of the key benefits Ireland offers tech firms looking to expand their business overseas. Since IBM landed in 1956 several other big-name tech firms have been arriving incrementally. The explosion in tech company presence kicked off in earnest when Google set up in 2003 and went on to establish its European Headquarters in Dublin. Ireland now boasts a significant presence of most major tech companies in the world, such as Microsoft, Dell, Intel, IBM, SAP, Facebook, LinkedIn, Twitter, HubSpot and PayPal to name but a few. There are almost 1,000 tech companies in Ireland ranging from the global superpowers to embryonic start-ups. Among this number is a vibrant local tech scene, with some Irish companies now expanding beyond Irish shores such as Stripe and Intercom. 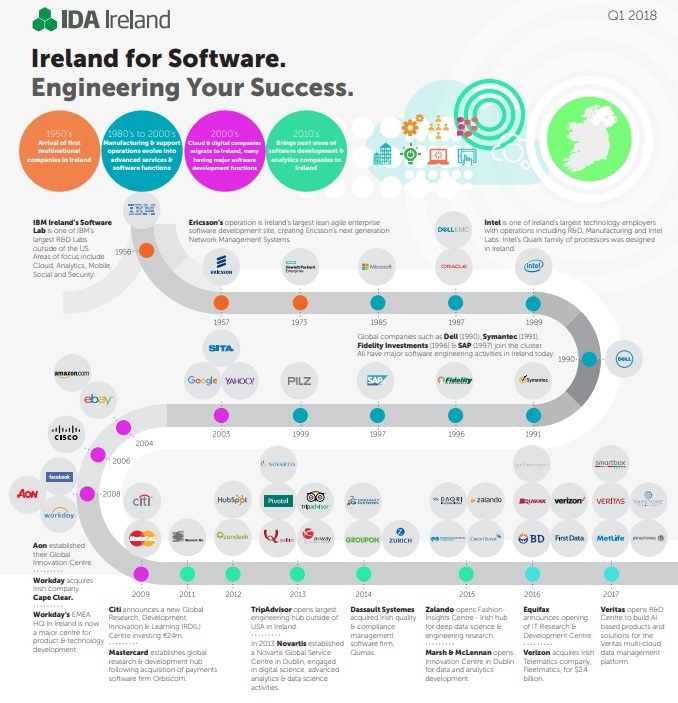 This infographic from the IDA gives you a good overview of the depth and scale of the tech sector in Ireland. While some companies may have come to Ireland to avail of the low corporate tax rates, they soon realised there are many more benefits to being here than fiscal prudence. It is often said that Ireland has a young, highly skilled workforce. This is, in fact, very true. Ireland has the youngest population in Europe with one third of the population under the age of 25. There are approximately 1 million people in the full- time education system; three quarters of these are in primary and secondary school with the remaining quarter in third level colleges and universities. One of the key findings of both reports was the education system in Ireland is meeting the needs to maintain a competitive economy by showing a strong connection between the colleges and universities and companies. There is a concerted effort being made to make sure the courses are providing graduates with the right skills to fill the job opportunities that are available in the tech sector. Regarding those that have come through the education systems, approximately 52% of Irish 25-34-year olds have a college or university qualification compared to an OECD average of 43%. So, it is fair to say Ireland has a young and skilled workforce. One huge advantage to setting up in Ireland is our membership to the European Union (EU). This gives companies access to over 500 million potential consumers. The customs union with a common external tariff on all goods entering the market. Any company incorporated in Ireland can enjoy the free-trade agreement and customs union that exists between EU states. In 1969 the idea of a single currency for the EU was floated. It finally became a reality in 1999. It was first used as an accounting currency with the 11 EU members running euro valuations alongside their domestic currency. In 2002, the euro replaced the domestic currency as legal tender of the 12-member countries. The eurozone, where the currency is active has since grown to 19 countries. The single currency has made trade much easier within the eurozone as the value of goods and services traded are not exposed to the whims of currency market fluctuations. Ireland has become recognised as a country that fosters R&D and innovation activity by companies. There are a few ways this has been achieved. A 25% tax credit is available for companies that are carrying out qualifying R&D activities. These activities include investigations and/or experiments in the areas of science or technology. The tax credit can be claimed in Ireland even if the work was carried out in another country but not claimed for in that country. The activity must be aimed at making a scientific or technological advancement and resolves something that was previously considered an uncertainty. The tax credit is calculated as 25% of expenditure from the qualifying activity and can be then offset the company’s corporate tax bill. In 2016 the Knowledge Development Box was created to encourage the development of intellectual property assets. A very favourable tax rate of 6.25% is applied to profits arising to this type of activity. Any qualifying research and development activity carried out in Ireland that resulted in patented inventions or copyrighted software is eligible for this tax rate. Some industries in Ireland are supported by innovation centres to help push the boundaries of progress. The centres are covered throughout the country and cover industries such as Bio-Engineering, Information Communications Technology, Nanotechnology and Marine Science. Are you a technology considering overseas expansion? If your technology company has international expansion plans, please contact us directly. You can request a call back from one of our Directors. Smart MBS is here to make your expansion into Ireland a reality.